Virtually all the internet’s dating websites can be fit into two categories: those with personality matching and those without. In the latter category, Match is the most popular (and, as we argued in a previous review of dating websites, one of the best). But there are literally hundreds of other websites where you can search through profiles using whatever criteria you’d like. 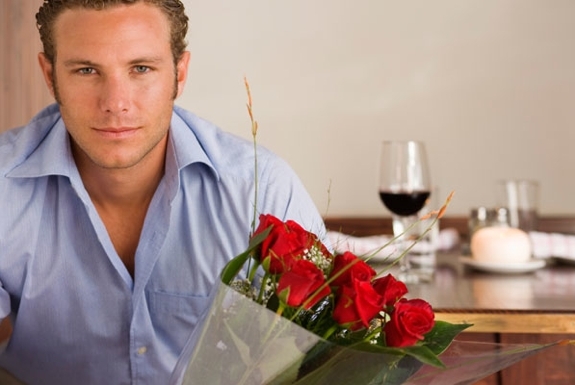 To start, it’s worth knowing the benefits of personality dating sites. There are two: one widely acknowledged and one more the personal opinion of Spot Cool Stuff. The first is this: A personality-matching dating website saves you time. If you live in a reasonably populated area and do search on Match.com — even a rather specific search — you’ll likely get dozens (or even hundreds) of profiles to wade through. A personality-matching site will do much (though not all) of the wading for you. Second, a personality-matching site might do a better job finding potential dates than you could. After all, if you are single then, almost by definition, you haven’t found that right guy or gal yet. Which means, heretofore, you haven’t picked out the right person. That might be the result of circumstance or bad luck. But it could also be because you aren’t so good at picking the right people from the wrong. So maybe a personality-matching site could do a better job. At the very least, it will encourage you to interact with people who you might not give a chance to otherwise. The Biggest Difference . . .
. . . between eHarmony and Chemistry is this: eHarmony has an extensive questionnaire that results in every user being ranked on 29 different personality aspects. Chemistry.com has a more informal questionnaire that tests for 4 different personality aspects. As a result, eHarmony has the more rigorous matching system. Although eHarmony has more members (approximately 20 million to Chemistry’s 12 million), you’ll get few matches sent your way on eHarmony. Those matches are better suited for you — at least in theory and, we think, in practice too — than they would be under a less strict matching system like the one Chemistry.com sues. On Chemistry, you’ll get more matches but they’ll be less targeted. Which of those is better for you depends partly on your personal preferences and partly on where you live. eHarmony is a better fit for people who want to spend less time on the site and/or who live in urban areas with lots of singles. Chemistry generally works better for those with the time to sort through more profiles and/or who live in more rural areas. Note also that eHarmony’s more rigorous matching system extends to who they let on their site in the first place. 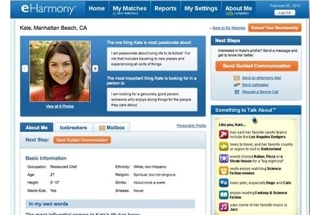 eHarmony claims that around 20% of the applicants to their website are rejected. The number one reason: the potential user is married. In addition, eHarmony’s users have to be over 21 (Chemistry minimum age is 18) and been divorced fewer than four times. eHarmony has even been known to reject applicants if their questionnaire suggests they are deeply depressed! Your view on all that, again, will depend on your personal preferences. Some people like that extra screening. Others find it overly judgmental. This might be a matter of personal taste, but to us the Chemistry website has a cleaner design and a more intuitive navigation than eHarmony. That said, neither site is difficult to use. If you aren’t a creative writer, don’t like email or simply aren’t a fan of written correspondence with people you don’t know, you’ll find eHarmony much more pleasant to use. The site has a “guided communications process” that takes much of the guess work out of what to write about. Click to learn more about how eHarmony works. Like almost every dating website out there, eHarmony’s users screw female — an estimated 67% are women. Chemistry is one of the rare dating sites that has a roughly 50/50 gender ratio. 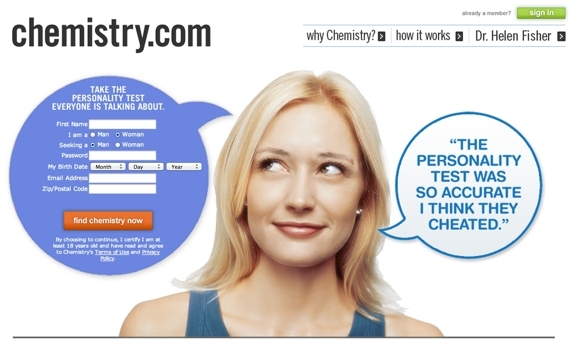 For the same reason Chemistry.com is better for meeting men (see above), eHarmony’s large percentage of female users give men on the site an advantage. No contest here. Chemistry has excellent sections specifically for gay and lesbian dating. eHarmony is exclusively for straights. Chemistry and eHarmony have similar demographics in terms of age, income and educational background. But eHarmony has a lot more singles with children — 42% to Chemistry.com’s 33%. After interviewing many users of both websites (and spending considerable time on each ourselves) our strong sense is that eHarmony users tend to be more marriage-focused. Singles on Chemistry are generally seeking long-term relationships too† but, as a group, seem a little less eager to tie the knot. Both dating websites don’t charge for setting up a profile but both cost money for full functionality. (Note: free dating websites offer a very low quality experience — click here for more on that). The exact price for each sites depends on how long you sign up for (see the Chemistry & eHarmony websites for the details) but, on average, Chemistry costs $10 less per month. In addition, Chemistry runs better sales. At the time of writing, Chemistry.com was offering a great promotion: three months for the price of one. eHarmony’s current best deal is a 20% reduction on a 6-month membership (if you click through that link and use promo code EHCODE). Clearly, which personality-matching dating website is best for you depends on your circumstances. If you’ve read through this whole post hopefully one of them — Chemistry.com or eHarmony — stood out as a better fit for you. If neither did, our suggestion is: sign up for both. It will take a bit more time, but both offer enough free functionality to get a feel for them. Whichever site you choose, we wish you romance in your future. † Those looking for casual let’s-maybe-just-be-friends dates tend to be on a site like HowAboutWe. Those looking for a quick hook-up are drawn to one of these fling-oriented dating websites.